Are you using a $5.99 computer cable to power your HiFi rig? A power cable’s quality should be determined by its ability to deliver current (continuously and instantaneous) and its ability to deal with the EMI (electromagnetic interference) effects of the components to which it is attached. The Soniquil power cables are the final piece of gear you need to achieve musical playback bliss. Why does a power cable matter? All of the wire and connectors in the electrical circuit can and do affect the performance of a component's power supply. The power cable is not the last six feet, it is the first six feet and the single most important link in the electrical circuit of your audio gear. Current itself cannot be contaminated but, the electromagnetic wave can be modulated with other frequencies from any number of pieces of equipment in your listening environment including cable and satellite systems to internet modems to cell phones and WiFi. When electromagnetic interference occurs, sonic quality is affected. 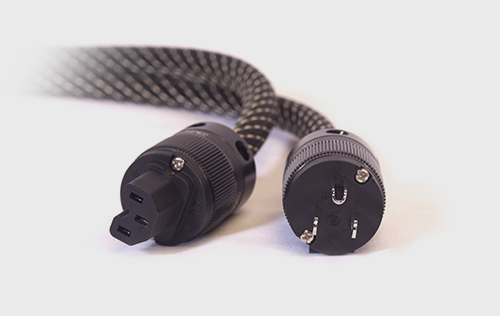 The Soniquil power cables help your audio component deliver the best sound stage, dynamic power, and tonal balance possible by blocking electromagnetic interference and delivering full current capacity to the power supply. Raven cables are made from 99.9% extremely pure oxygen free copper combined with high-quality rhodium-plated connectors and an expertly designed EMI shield. Rhodium plated connectors with high purity, 99.99% oxygen free copper wire. Electromagnetic Interference is an enemy of power supplies in audio equipment. Through well thought out engineering and the use of proper materials, Raven’s Soniquil power cables are highly resistant to EMI. The ability to deliver current both continuous and instantaneously is key in allowing audio equipment power supplies to operate at full specification. Many cables use wire that is either undersized or use connectors that are attached in such a way to add resistance to the circuit. Soniquil Cables use heavy-duty low-gauge wire with great attention to the assembly. Soniquil cables are elegant and beautiful. While designed to have an integrated look with all Raven Audio products they are neutral in color presentation and visually match most any audio component. Soniquil cables are sure to elevate both the look and sound of your system.